ACI prioritizes safety at the top of its list. Safety is part of our foundation. 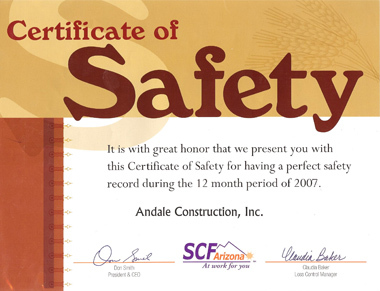 The Arizona Minority Business Enterprise Center (AMBEC) in June 2008 chose ACI as the recipient of a very prestigious honor: Arizona's Minority Contractor of the year. When ACI started we did not have an EMOD rating in place. After one year in business we achieved this rating. But we knew our EMOD rating would be representative of how ACI conducts business. Our first year in business we had zero incidents and zero time lost accidents. Zero traffic incidents and we constantly reminded our employees of these concerns. Our first EMOD rating was 0 .92 for 2007. Our EMOD rating for 2008 was 0.90 and as of July 2009 it dropped to 0.82. We take great pride in seeking to achieve EMOD even to a lower rating knowing our employees and R-O-W work zones are in a safe environment. Another component to safety is our communications protocol to assure first responders can have ability to make a difference in a situation that may require safety application of rescue. Safety certificate for 12 Months period of zero accidents from our Workman's Compensation carrier.